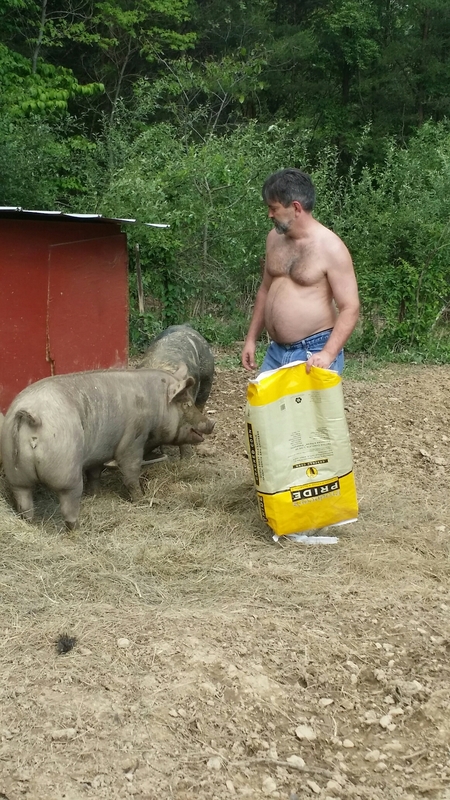 I took these photos to show the size of our pigs now. Remember, these two fit in a small dog cage when we brought them home in late October! 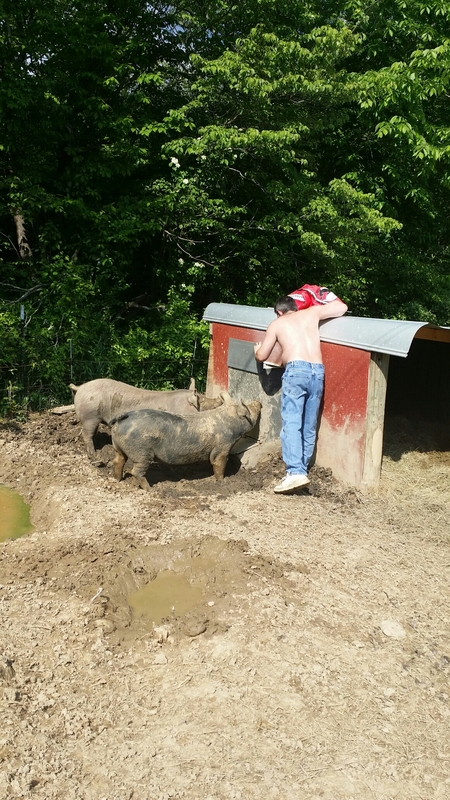 They are standing in about six inches of mud here (Ted made them a big mud hole a couple of days ago because it was so hot, and pigs can’t sweat so they need mud so they can cool off). I thought Dixie was going to climb up the feeder to get the corn! She loves ground corn. She kept trying to jump up to the bag, but she’s so heavy that she couldn’t. Bitsy kept knocking Dixie away from the corn so Ted poured her a big bowl just for her. Here you can really see the sheer size! We’re guessing she’s about 300 pounds of solid pork. These girls were raised completely on pasture, bales of hay, all the eggs I could spare from the chickens, tons of scraps, and feed that I had mixed at the feed mill which included corn, barley, oats, beet pulp, and a small amount of hog feed. They got to live their entire lives being pigs and doing piggy things: rooting, digging, running, burrowing, rolling in mud, and playing. I grew them slowly so there wouldn’t be tons of fat, and I’m hoping for perfectly marbled meat because of this! 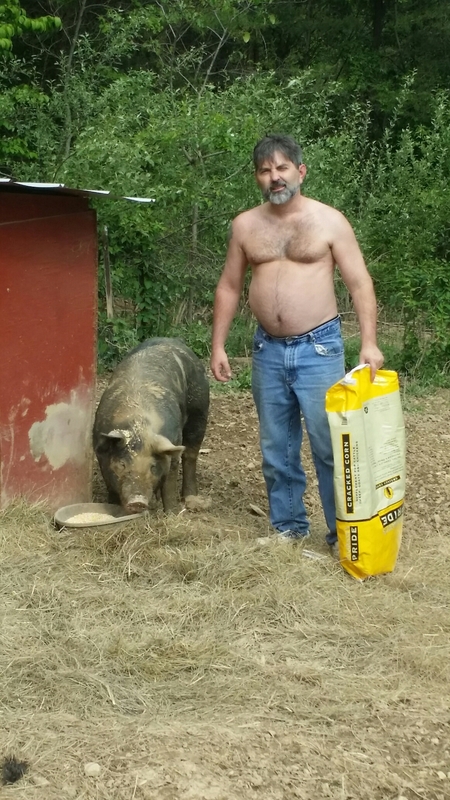 I have absolutely loved raising pigs, and it is something that I plan to do every year from now on. 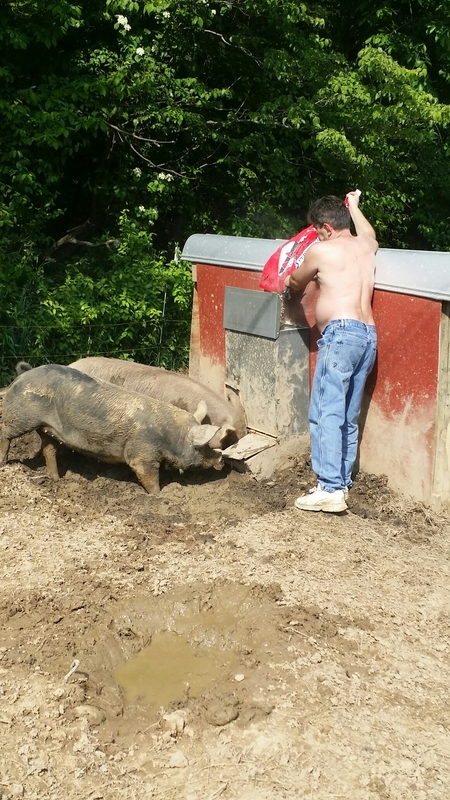 As soon as I can get the fencing in place, I plan to offer pastured pork for pre-order and sell half or whole sides!